Elegance makes a simple but bold statement in this Apples of Gold solitaire gemstone ring. The ring is defined by the single London blue topaz gemstone that measures 6mm, 7mm or 8mm. This marvelous stone boasts the rich color of cobalt blue in its most beautiful form. 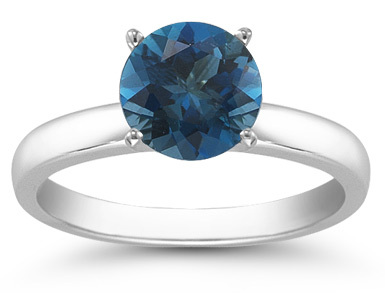 The London blue topaz gemstone is given a four-prong setting to keep the stone in place. Bright white silver provides a stunning contrast in the ring as a polished band. The sleek form of this solitaire gemstone ring offers the best in elegant jewelry. Your choice of 6mm (0.85 carats), 7mm (1.25 carats), or 8mm sizes (2.05 carats). We guarantee our London Blue Topaz Solitaire Ring in Sterling Silver to be high quality, authentic jewelry, as described above.